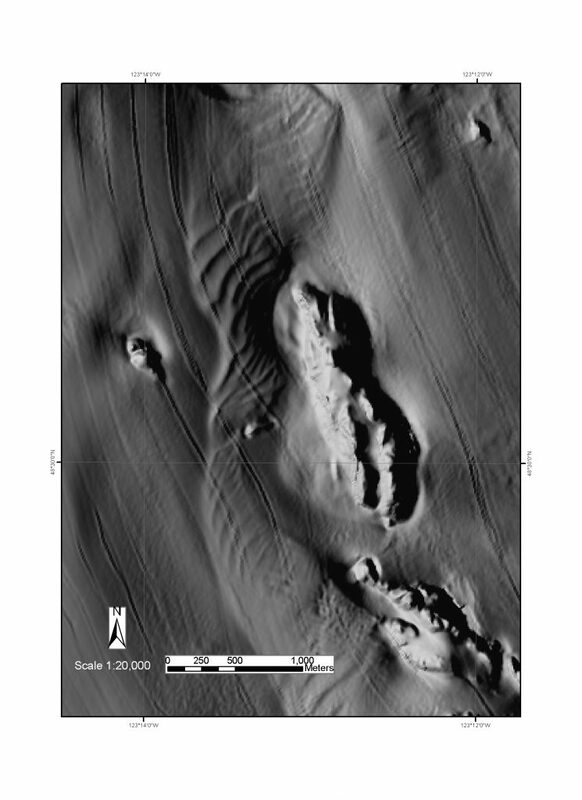 The Habitat Center utilizes multibeam bathymetric data (bathymetry xyz and backscatter data) to construct thematic maps including bathymetric artificial sun-shaded relief, geologic, geomorphic, geologic structure and hazards, habitat, contour, slope inclination, roughness derivative and other specialty maps. Arrays of soundings perpendicular to the ship’s track are emitted from a sonar system, make contact with the seafloor and are projected back to the sounder and recorded, providing 100% coverage. Frequency and resolution varies among sonar systems. The higher the frequency, the higher the data resolution at a certain water depth. 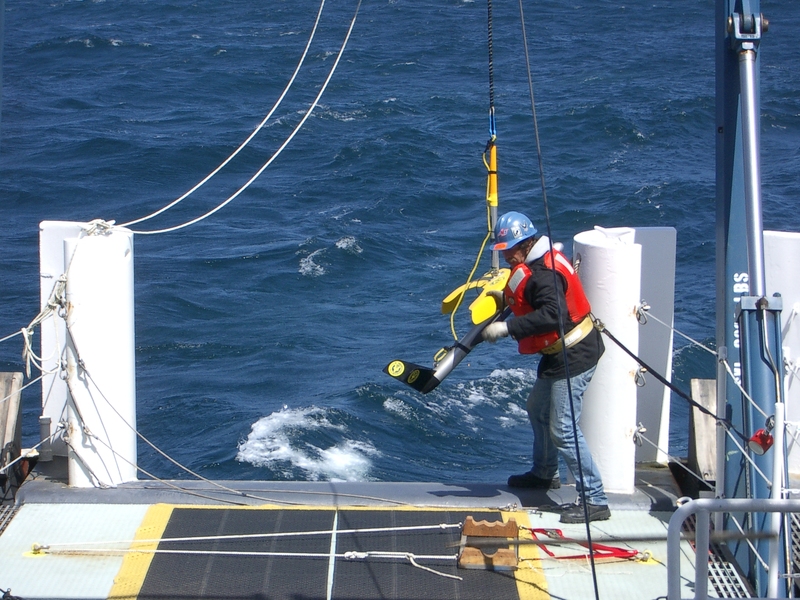 Several Multibeam Echosounders (MBES), including Reson,® and singlebeam bathymetric systems have been used to collect seafloor data for Center for Habitat Studies clients across the globe. Clients have used the MBES data for many different purposes including fisheries management, geohazards assessment and bedform dynamics. The MBES data provide clients with critical information about the depth and size of geologic, biologic and anthropogenic features. Depending on the sonar system being used, backscatter data are collected with the MBES data and provide texture information of the seafloor such as sand or gravel. Side-scan sonar (Sonar = sound navigation and ranging) systems are also used (including 100 kHz Klein® and EdgeTech®) to detect objects on the seafloor and collect textural information. 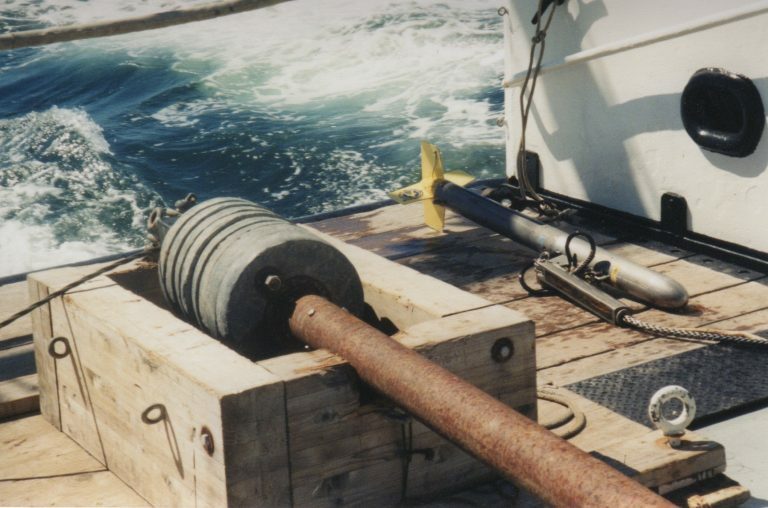 Similar to multibeam and singlebeam sonars, a sidescan towfish transmits sound energy and records the strength of the return signal (echo) that has made contact with the seafloor or other objects. Objects projecting from the sea bottom create a strong return and, thus, show as a light area on the data. Areas of the seafloor with little or no return show as dark (or vice versa depending on operator settings). Most sonar systems do not collect depth information. The Center for Habitat Studies has utilized seismic profiling systems for clients requesting information on cable/pipeline status, dredging, submarine landslides, seeps/fluids, faults and rock types. Seismic reflection profiling data provides information such as sediment thickness by penetrating the seafloor in shallow or deep water. The system is towed or mounted to a vessel. Higher frequencies create higher resolution imagery. Scientists at the Center for Habitat Studies (CHS) utilize a Terrestrial Laser Scanner (TLS), which is useful for collecting information regarding surface topography. General topographic surveys are conducted and used to establish a baseline elevation framework in a specific area of interest. Each survey includes high resolution photographs and point clouds allowing for 3‐D image draping over DEM surfaces. Uses of a TLS include short (24 hr.) and long‐term (seasonal) change detection of tidal wetland environments as well as high-resolution surveys and quantification of beach sediment dynamics. Findings include identification of specific sites of fine‐scale erosion and/or deposition and correlation with hydrologic variability. The data are displayed in the form of before/after 3‐D images of geomorphologic change. The CHS uses Unmanned Aerial Vehicles (UAV) for the purpose of surveying terrestrial and marine/freshwater areas. The UAV flies in the air without a human operator and uses aerodynamic forces to provide lift by a pilot on the ground. 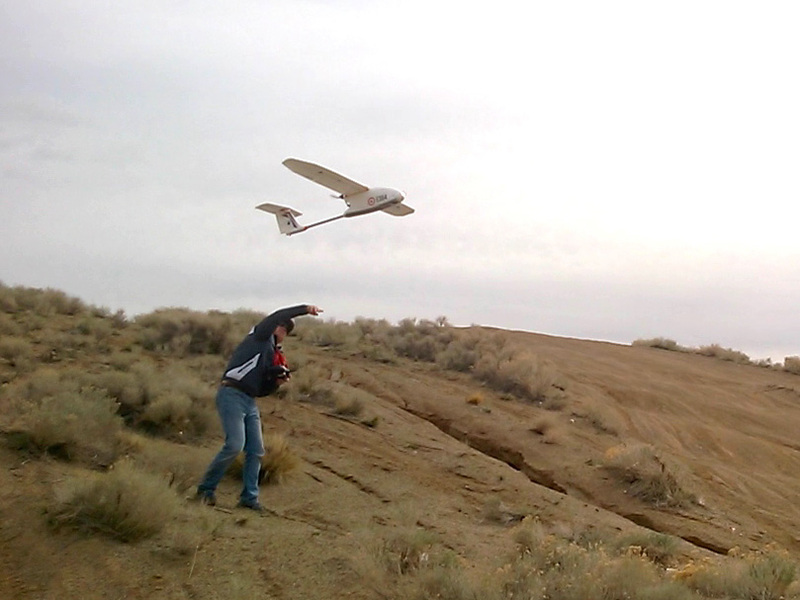 A UAV allows scientists to track and monitor biotic and abiotic elements without disturbance to the natural environment. 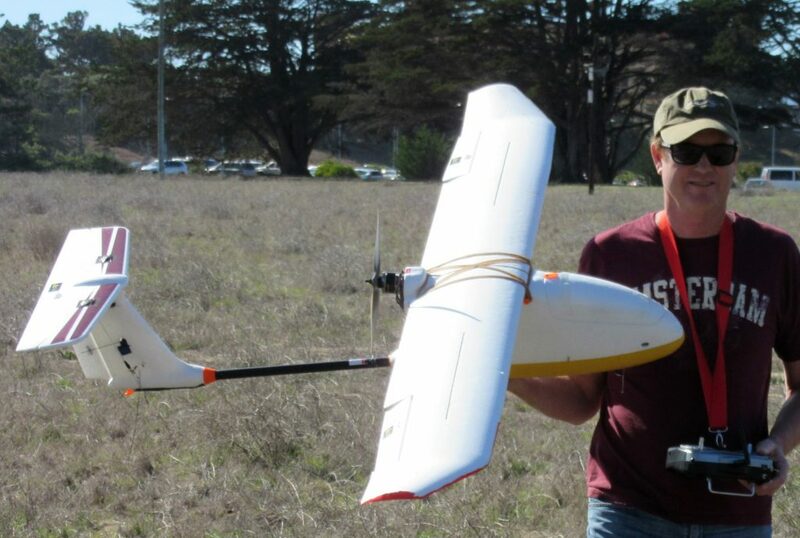 Additionally, a UAV can collect orthoimages and elevation data of coastal drainage areas. The Center for Habitat Studies has the tools and technology to examine numerous types of samples collected in the field. 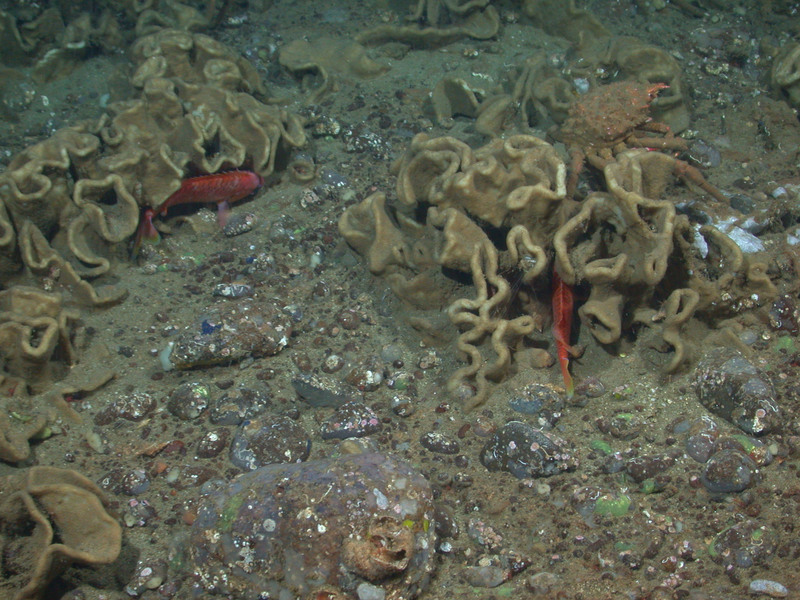 These samples are used to document substrate composition and to groundtruth habitat interpretations, which can result in the validation of a soft, mixed, or hard sea bottom. Moss Landing Marine Labs is equipped with a variety of tools for analyzing sediments and rocks. For example, a Terrestrial Laser Scanning devise and 3D data analysis tools are used to analyze accurate land measurements. Also, the lab is equipped with a freezer for sediment sample preservation which may be used for analysis and possible re-analysis. 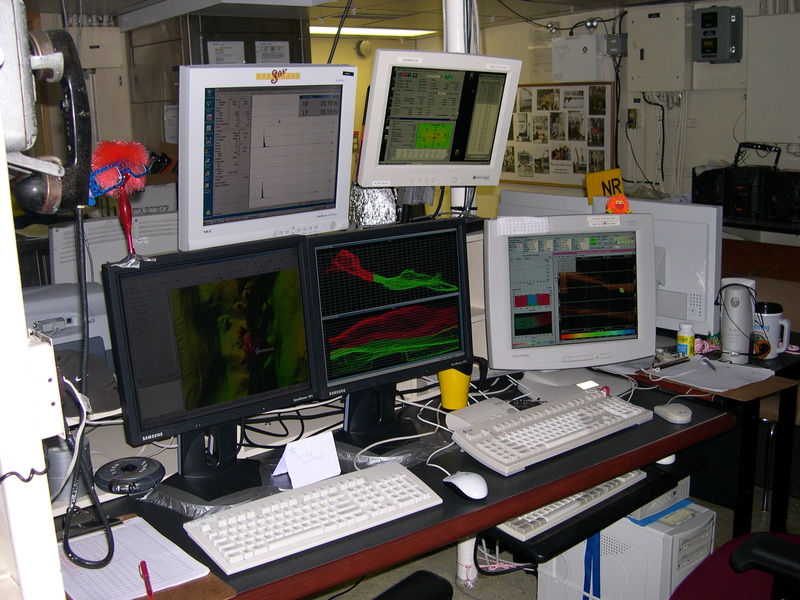 The lab provides capabilities for analyzing sediment cores, rock samples and particle size measurements. A Rho-Tap® sieve shaker is available for a full grain size distribution of both organic and non-organic material. The Center for Habitat Studies characterizes and maps marine benthic habitats and marine and coastal geohazards using Geographic Information System (GIS) software. The Habitat Center processes and analyzes digital multibeam bathymetric data (bathymetry xyz and backscatter data), analog and digital side-scan sonographs, seismic reflection profiles, and other geophysical data to construct thematic maps. The Center's facility is well appointed for mapping projects. 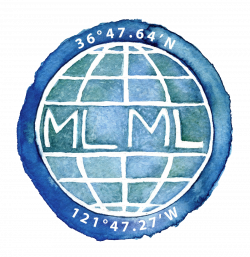 It is located in the MLML Norte building on the spit at Moss Landing and contains multiple computers, scanners, plotters and printers capable of producing publication quality maps in large sizes. GIS software such as ArcView®, ArcInfo® and CARIS® are used in data compilation, digitizing, and display. A variety of software is used to georeference and produce “fly-throughs” (ERDAS Imagine®) of various digital data. The Habitat Center also has a modern video lab stocked with the latest video editing equipment. The Center for Habitat Studies (CHS) has capabilities to facilitate the determination of habitat associations for commercially important marine fishes and invertebrates. As mandated by the 1996 Magnuson-Stevens Fishery Conservation and Management Act, “Essential Fish Habitat (EFH)” must be identified for all species that are fishery targets in order to facilitate the construction of Marine Protected Areas (MPAs) for effective management. The Center for Habitat Studies is uniquely qualified to undertake biological studies because of its extensive history of work in the field of fisheries-related habitat mapping as well as its incorporation of fisheries biologists with expertise in habitat studies. Capabilities include: spatial analysis of habitat data, video analysis of habitat types, invertebrates and fishes (e.g., identification and enumeration as well as determination of distribution, relative abundance and density), statistical analysis, and production of figures, tables, and completed reports or manuscripts. Projects incorporating both habitat mapping and subsequent evaluation of fish-habitat associations are possible. Scientists at the Habitat Center have broad experience in the collection and analysis of data necessary for habitat studies of demersal fishes and invertebrates. Scientists at the Center for Habitat Studies have several years combined experience writing scientific and technical papers published in national and international journals. CHS Director, Dr. H. Gary Greene has authored or co-authored over 250 scientific papers, maps and books. Additionally, scientists at the CHS have presented their research at professional meetings and institutions including the United States Geological Survey, the Monterey Bay Aquarium Research Institute, American Geophysical Union, GeoHab, Geological Survey of America, American Fisheries Society, and the Western Society of Naturalists.